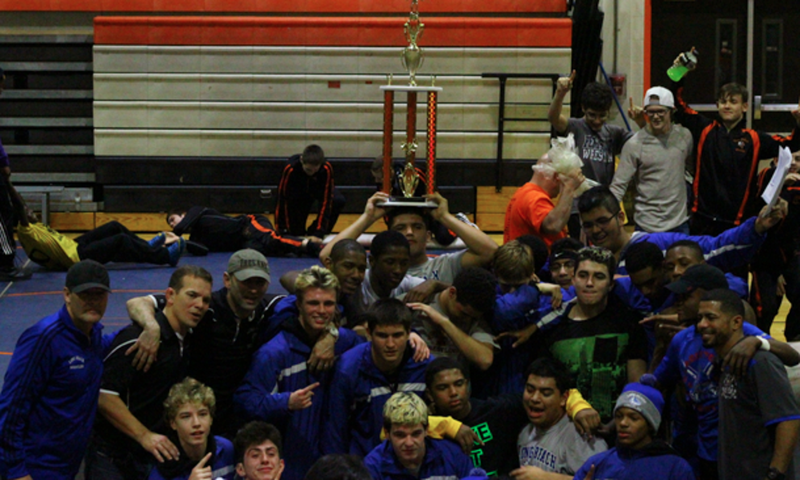 See how the dramatic championship dual between Long Beach and Hilton occurred below. Alvarez jumps out to the 2-0 lead, but Neuffer quickly gets the escape and a TD of his own for a 3-2 lead. Neuffer riding tough, gets the arm bar and looking for the turn ... and picks up near fall. And with 6 seconds left in the first, Neuffer gets the fall. Burgos on the attack early and strikes first with at TD about 30 seconds in. Burgos gets the turn for 2 nearfall after a point awarded to Maquet. Burgos turns him again for three more at the end of the first to make it 7-1. Second period starts in neutral. Burgos goes upper body and gets the TD and has him on his back .... and gets the fall on the edge with 1:14 left in the second. Martinez gets on the board first with the TD on the edge. Reversal for Diakomihalis and right to the cradle. And there's another fall for Hilton, 56 seconds into the match. Robertson in right away for two, but a quick escape makes it 2-1. Deep shot by Martinsen, Robertson counters, looking for a cradle. Martinsen wins the scramble for the TD and a 3-2 lead. Martinsen close to near fall, but Robertson able to fight back to his stomach. First period ends 3-2. Second period begins in neutral. Double leg for Robertson and the TD. Reversal to the back for Martinsen and he gets the pin. Hertel scores just seconds into the match and releases. 2-1 Hertel. That's how the first period ends. Hertel takes down for the second and immediately gets the reversal. Escape Maquet and it's 4-2 Hertel. Maquet answers with a TD, but Hertel escapes and it's 5-4 Hertel after two. Escape Maquet to open the third and it's 5-5. Deep single for Hertel and he gets the TD. Just under a minute remaining and it's 7-5 Hertel. Escape Maquet and it's 7-6. 20 to go ... out of bounds, fresh start. Stall warning on Hertel. Shot from Maquet, front headlock from Hertel and he wins 7-6. Bourne with the opening TD to go up 2-0. Cradle locked up by Bourne and he's getting backs ... and it's 5-0. Bourne getting near fall again but Hodgson hangs on to avoid the pin as the first period expires. 8-0 lead for Bourne. Bourne starts on bottom for the second. Reversal makes it 10-0. Hodgson escapes to make it 10-1. Bourne close to a pin but Hodgson gets out. 14-3 with 25 seconds remaining in the second. 14-3 heading into the third. Hodgson begins on bottom. Stall warning on Hodgson before he escapes to make it 14-4. Quick TD for Bourne 16-4. 20-9 with 6 seconds left and Bourne wins 22-9. TD Diakomihalis off the whistle. Running the arm bar, but no points. Colletti escapes, but Diakomihalis with another quick TD and puts Colletti on his back. Bridge from Colletti and the period ends 7-1. Diakomihalis on bottom to start the second, escapes to take an 8-1 lead. Single leg, switches to a double, TD for Diakomihalis. 10-1. Diakomihalis cuts him with 34 to go in the second. 10-2. Another TD to end the period 12-2. Colletti on bottom for the third. Diakomihalis working for turns, but doesn't get it and it ends 12-3. Great scramble. No points. Mid first period. First period ends 0-0. DePrez chooses down. Spada cuts him, 1-0 DePrez. Spada on the attack and he scores the first TD plus back points midway through the second, 4-1. Spada with some big mat returns and it's 4-1 after two. Spada takes neutral for the third. 23 to go. Spada wins 4-1. TD Paez about 30 seconds in ... getting back points now. 5-0 Paez. First period ends 7-0 in favor of Paez. Hoos starts on bottom in the second. Reversal makes it 7-2 and another reversal makes it 9-2 Paez. Escape Hoos, but TD Paez in the last 10 seconds. 11-3 Paez at the start of the third. Paez on bottom for the third. Reversal extends the lead to 13-3 with 1:15 left. Escape for Hoos, 13-4, just under a minute remaining. TD Hoos, escape Paez. 14-6 with 15 left. Paez wins 14-6. TD for Byron and he leads 2-0 halfway through the first period. Escape Shamp. 2-1. Byron with another TD with just 15 to go in the period and he leads 4-1 after one. Shamp released to start the second and it's 4-2. Byron with a variety of attacks, but Shamp defends. Byron does convert with about 1:10 to go in the second and lets him go and follows with another TD. 8-3 now mid second. Escape makes it 8-4, but another TD from Byron and it's 10-4. The middle stanza ends 12-5. Third period will start in neutral. Byron strikes again to make it 14-5. Lets him go, 14-6. A series of takedowns and releases makes it 20-9 with 36 sec to go. Byron nearly gets the fall at the buzzer but comes away with the 28-11 tech fall. Spallina in deep early, but Giorlando fights it off and we're scoreless 30 seconds into the bout. TD for Spallina and escape from Giorlando make it 2-1 with 45 to go in the first. The first period ends 2-1. Giorlando chooses down. Quick escape makes it 2-2. After the second period, it's tied at 2. Spallina on bottom to start the third. He gets out right away and Spallina leads 3-2. A couple single attempts for Spallina, but nothing there. 30 to go. Spallina gets the 3-2 decision. DePrez was awarded the TD but it was then ruled out of bounds. 39 to go in the first. Scoreless. Another attack on the edge and this time the TD stands for DePrez and he leads 2-0. That's the score at the end of the first. Bromley chooses neutral for the second. Throw by Bromley and he gets the TD. Deprez avoids back points and escapes. 3-2 DePrez. Deprez then in on the leg for a 5-2 advantage. Deprez rides out the period and leads 5-2 going into the third. DePrez will be on bottom to start the third and Bromley cuts him. 6-2 DePrez with two minutes to go. Now one minute left. Deprez gets to the ankle, converts for the TD and leads 8-2. DePrez wins 9-2 after a penalty point. Russo gets to the legs first, but Rodriguez gets away. Rodriguez then gets in deep, but Russo scrambles to the TD. 2-0 Russo. Tough ride by Russo who leads after one, 2-0. Another leg attack from Russo, but Rodriguez counters with a TD and back points. Escape Russo and it's 5-3 Rodriguez with 51 to go in the second. Injury time for Rodriguez. Russo again to the legs, but Rodriguez spins behind for a TD late in the period and leads 7-3 after two. Third period starts in neutral. TD for Rodriguez, who is up 9-3 with a minute to go. And that's the final. It all comes down to 220 with the score tied at 31. Flurry at the end of the first, but no scoring. Fuino down to start the second and he escapes to make it 1-0 Fuino. 136 to go in the second. Rivera gets behind, but doesn't get control and they go out of bounds. 1 min to go in the second. Single from Fuino and again they go out of bounds. Second period ends 1-0 Fuino. Rivera will take down for the third. Fuino drives him out of bounds twice. 1:23 to go. Escape for Rivera with 1:10 to go. Now 20 seconds left. TD with one second left on the clock by Rivera for the win! For details on the semifinals, see below. Elfstrum with a quick TD and near fall and leads 5-0 mid first. That's the score after one. In the second, Elfstrum begins with a reversal to make it 7-0 and rides out the period to lead 7-0 after two. Fuino escapes to start the third, but another TD by Elfstrum to make it 9-1. We'll see if he can ride it out for the major. He does. McShea on the attack from the start and gets the first period fall. Neuffer on the board first with a TD ... and he gets the fall. Earl takes the 2-0 lead in the first. Tough ride by Earl, 2-0 after the first. Reversal by Earl in the second to double his lead, 4-0. Earl up 6-0 now with just under a minute left in the third. Earl picks up the 6-0 win. Nice scramble to start the match, with Diakomihalis getting the TD. Escape Vespa and then another escape in the second. 2-2 at the end of two periods. Vespa rides out the third to send the match to sudden victory. Diakomihalis gets the TD in overtime to earn the 4-2 win. Stramiello with the first period fall. Hertel has a 2-1 lead with about 30 seconds left in the first. Hertel continues on the attack and has a 9-4 advantage mid second. Hertel leads 19-5 early in the third. Hertel picks up the 21-6 tech fall with about 30 seconds left. Fall for Kelly in the first period. Eckerson takes a 2-0 lead into the second, but Wilmot rides him out in the middle period. Still 2-0 heading into the third. Penalty point award to Wilmot on slam. Trainer coming out to the mat. Huge applause as he stands up after a 20+ minutes. Very happy to see him move. DQ win for Hilton. ​Fini leads 6-2 heading into the third period and that will be the final score. Scoreless after the first minute and the first period. Barczak on bottom to start the second. Reversal and near fall for Barczak to lead 4-0. Into the third period now, in neutral with the score still 4-0. That will be the final score. 8-3 lead for Mickelsons in the second period, with about a minute to go in the middle stanza. Mickelsons adds a TD with about 30 to go to get into major decision territory with a 12-4 lead. He rides him out for the major. Spallina records the first period pin. TD plus 2 NF right away from state champ DePrez. More back points makes it 10-0 at the end of the first period. Top work from DePrez makes it 13-0 and he finishes with a 16-0 technical fall for the Hilton victory. TD right off the whistle for Bromley. Releases him, 2-1 Bromley mid first. Another TD for Bromley and he leads 4-1 after the first. In the second, Bromley starts on top and picks up near fall for a 6-1 lead. At the end of the second, Bromley leads 6-3. Quick escape for Bromley in the third to go up 7-3. Bromley adds at TD on the edge and releases, now 9-4 with about a minute left. Casey turns it on at the end, but it isn't enough as Bromley wins 9-7. No scoring in the first. Escape for Rivera to start the second. Baker with a 2-1 lead, about a minute remaining. Stall warning on Baker. Now 20 to go ... and Baker comes away with the 2-1 victory. After the first, still scoreless. Smith chooses bottom for the second. After about 40 seconds, escape by Smith. He leads 1-0. That's still the score entering the third with Miranda taking bottom. Smith turns him and is picking up near fall. He's looking for the pin ... and he gets it. Martinez gets out in front first with a TD, gets the turn and the fall. In a dual full of pins, Wantagh answers with another one. Vines out to a 4-1 lead in the first and riding tough. He continues to expand his lead, with a 9-2 advantage with about 1:20 to go in the second. Another fall for Wantagh. Maquet opens the scoring with an escape in the second and then tacks on a takedown for a 3-0 lead. Escape and TD now for Killard to knot the score at 3, 30 sec to go in the second period. Escape Killard and he's up 4-3 with a minute and a half left. Maquet in deep by Killard with some nice defense to force the action out of bounds. Killard with the come-from-behind 4-3 win. Bourne strikes first with a TD and leads 2-0 with 36 to go in the first. He extends his lead to 4-0 with 1:17 left in the second. Injury timeout. Back to action and Bourne is up 4-1 after two. Escape for Wantagh, but Bourne answers with a TD for a 6-2 lead. Release and TD for Bourne and another release. 8-4 now. And that's the final. Teemer with a pair of TDs in the first and a 4-2 lead midway through. After one, the two-time state champ leads 8-3. Teemer goes feet to back with the big move, but Langan does well to avoid the fall. 13-4 now with 134 to go in the second. 15-8 after two. Now 18-8 with 35 to go. Teemer with a TD and 2 NF at the buzzer for the 26-10 tech fall. Great back and forth match. Colletti with near fall as time expires for the 4-2 victory. Spada in control after the first with an 8-2 lead. In the second, Spada expands his lead to 10-2 with just over a minute to go in the period. Spada continues to attack and is up 20-8 about a minute remaining ... now he's looking for the fall. He gets it. Byron gets on the board first with a TD and is in control on top in the first. He takes a 2-0 lead into the second and will choose bottom. Byron now up 4-0 midway through the second and we're back in neutral. Front headlock for Byron into a cradle and the fall. 2-1 advantage for DeVivio after the first period. They'll start in neutral and DeVivio immediately on a shot for the 4-1 lead. Another pin in a dual full of them as DeVivio picks up six more points for the Marines. Giorlando attacks right off the whistle for a quick TD plus near fall for a 5-0 lead. He hasn't slowed down here in the first with a 9-1 advantage with 40 seconds still remaining. Giorlando pouring it on with a 16-3 lead midway through the second. He earns the 18-3 technical fall. Rodriguez on the board with a first period TD. Escape Copolla and blood time. After the break, Copolla evens the bout at 4-4, before Rodriguez moves ahead 5-4 with 45 to go in the second. Reversal by Rodriguez to increase his lead to 7-4 and that's how the second period ends. Rodriguez had him on his back to end it, but it looks like a 14-6 major. For full results, see PDF below. Schedule for tomorrow and full results in PDF below. See full results in the PDF below. See Results in PDF Below.